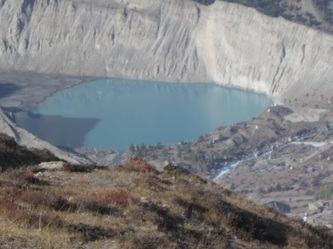 Tilicho Lake is a lake located in the Manang district of Nepal. 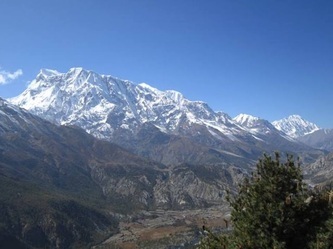 It is situated at an altitude of 4,919 metres in the Annapurna range of the Himalayas. Tilicho Lake is the destination of one of the most popular side hikes of the Annapurna Circuit trek. The hike takes additional 3–4 days. 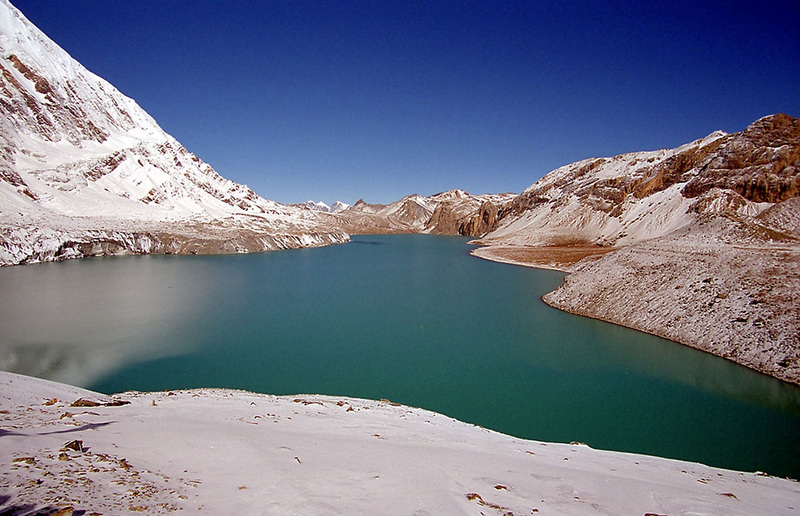 Tilicho Lake lies peacefully at the centre of the surrounding peaks of Tilicho and Nilgiri. This trek adventure is challenging. This special trek route branches off from the main circuit from Manang and then rejoins at Yak Kharka. 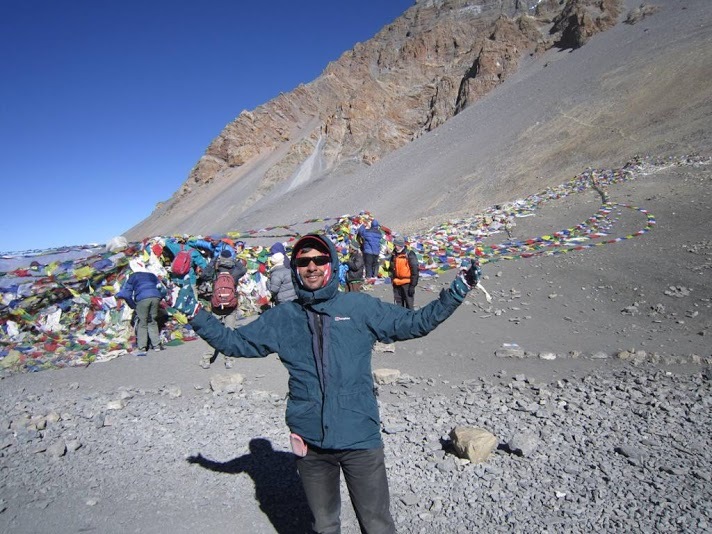 Then from Yak kharka the trial leads to Thorong La pass, the highest pass of the world (5416 meters). 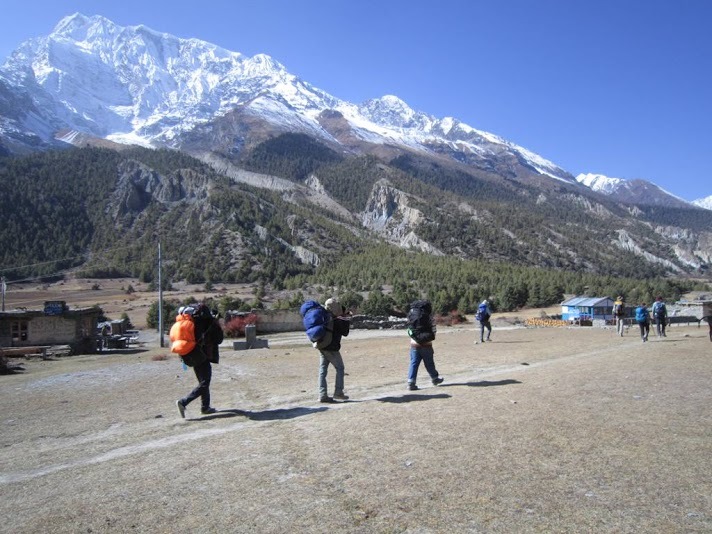 Thus this trek combines two main adventures of Annapurna region. The mesmerising feel of Tilicho Lake and stunning views of Mountains makes this trial a wonderful trip. You can capture the views of Lamjung Himal (Himal means Mountain in Nepalese term), Annapurna II, Gangapurna, Annapurna III, Annapurna IV, Tilicho Peak, Pisang Peak, Nilgiri Mountain and Chulu Peak. 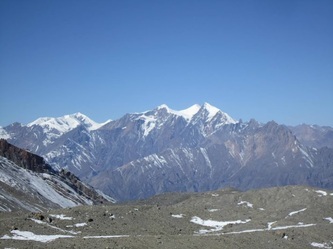 From Tilicho Lake you also have the option of crossing the challenging pass of Moesokanta La Pass” to Jomsom instead of travelling to the Thorung La pass but proper additional equipment including tented camps are required to go through this pass. Trekking distance 12 km approximately 6 Hours walks. Trekking distance 15 km approximately 7 Hours walks. 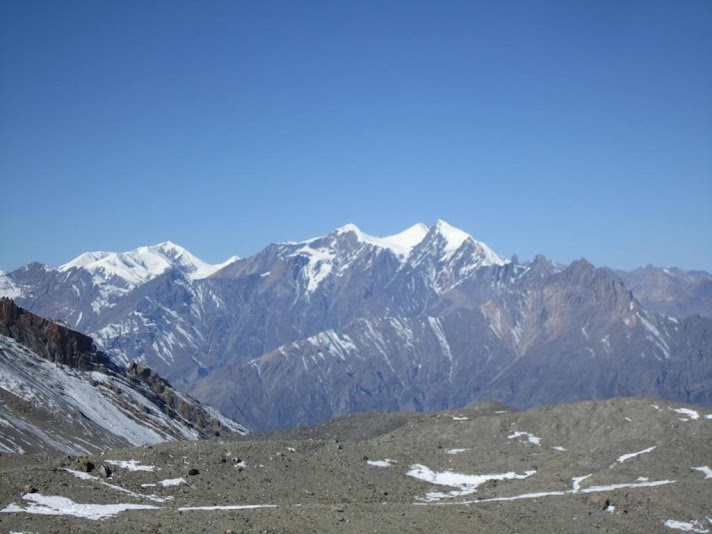 In Afternoon Himalayan Rescue Association (HRA) provide altitude lectures for the trekkers and it will be worth attending one of those lectures. They give some useful tips on how to battle through the next 3 days to Thorung La pass. They will also explain the acclimatizing principle of "climb high and return to sleep in the low". From the main Village we drop around 15 minute and cross the Marshyangdi River and Continue climb up to Chongar Viewpoint, quite steep but amazing 360 degree views from the top. Recommended especially if you're not visiting Ice Lake or Tilicho Lake. Praken Gompa just 400 m above the manang Village where one old monk Tashi Lama stay there and give the blessing for Trekkers for successful of throng la pass. It was really a great experience no one could forget it. 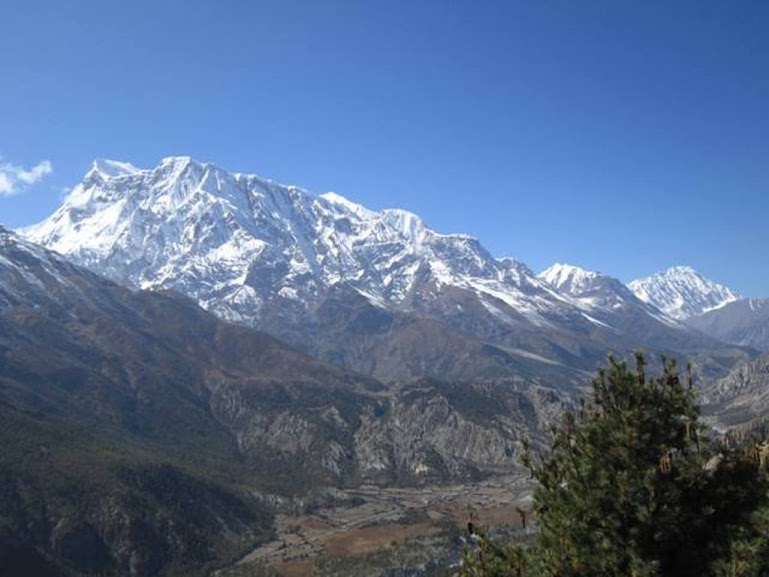 From Praken Gompa we can see beautiful views of the Annapurna Himalayas range and Tilicho peak . This trip also perfect for acclimatization. 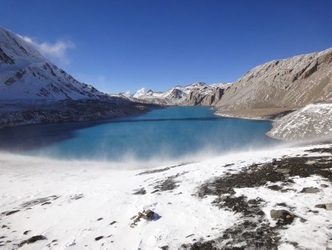 One of the most impressive viewpoints on the Annapurna circuit trekking routr is Ice Lake (Kicho Tso, 4620m). It takes about 5 hours to climb 1000m from Manang Village , it’s straight uphill the whole way to the Lake which is considered sacred by Buddhists. Descending from old Manang and passing by Chorten reach a Marsyangdi river, cross a suspension bridge over Jharsing Khola (stream It is possible to cross the ridge north of Annapurna IV, II, and Glacier Dome or to descend from village to the glacial lake at the foot of a huge icefall descending from the northern slopes of Gangapurna. The trail stays close to the river bed and soon we approach Khangsar, superb view of the Great Barrier open up. Where we can find a small monastery, chorten, Mani walls and prayer flags. 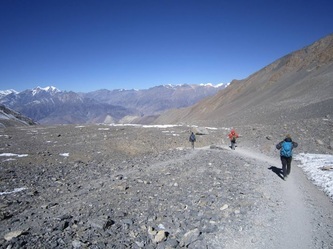 From Khangsar the trail climbs steeply past the Gompa and small chortens, trail goes through juniper and sea buckthorn bushes. The path is quite covered by small crystals and shrubs can be seen on both sides. 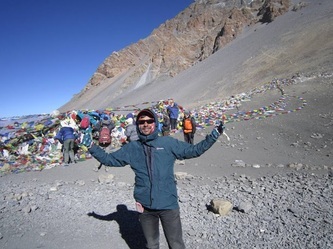 Some places along the trail you cross a few streams.You reach a crest (4650m) with prayer flags after the wearying clim and then through a series of zigzags down a scree slope bring you to the Tilicho Base Camp Hotel. From here you can enjoy the closer and panoramic views of Tilicho Mountain and many others. 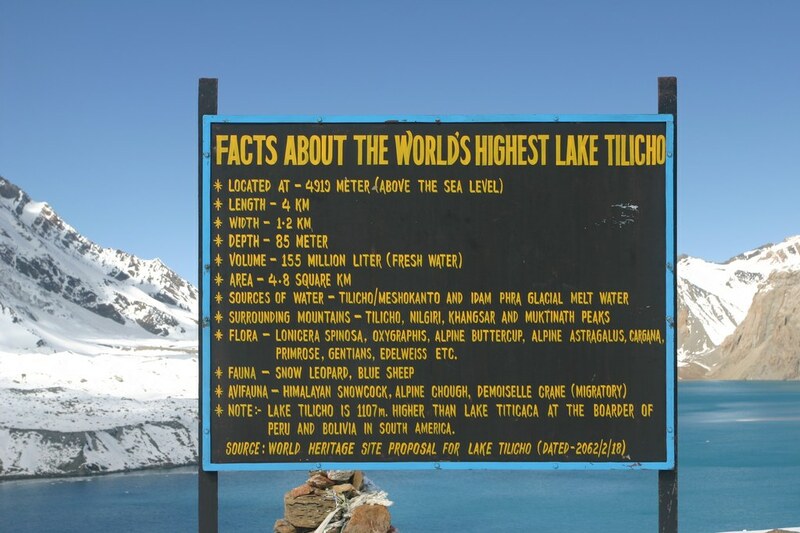 Tilicho Lake is situated at the highest altitude so we set our camp today here at low. The trail to the Tilicho Starts up a side valley then traverses onto a moraine, making a long climb to 4710m. There are outstanding view of Tarke Ghyang, Gangapurna and the Khangsar Kang. Tilicho Lake, the highest lake in the world at (4920m), presents a particularly dramatic spectacle. Sometimes its turquoise water reflects the surrounding peaks but more often its frozen solid. After spending the memorable time at Tilicho Lake, we will trek down to Tilicho base camp via same way for overnight stay. Early morning wake up and look around Muktinath temple and after breakfast we trek to Kagbeni Now we leave the motor road and trek through Chhangur, Jhong & Putak the Tibetan styled beautiful villages with its art, culture, religion and gompas. 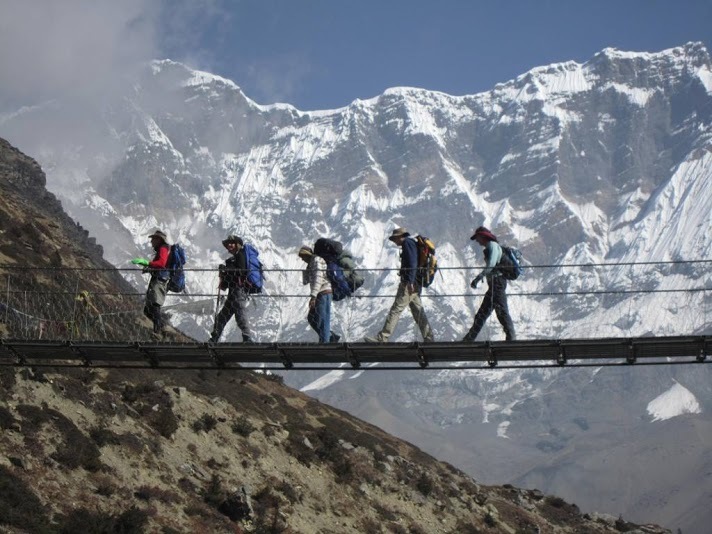 This trail is so splendid view of Dhaulagiri and Nilgiri mountains. The way is lower part of Mustang we meet the entry point of Kagbeni which is gateway to forbidden Mustang Kingdom. Then after the land looks like the moon desert until to reach the Kagbeni. 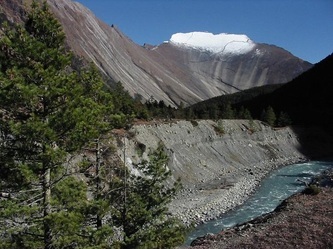 Kagbeni is situated in the bank of the famous holy river Kali Gandaki and it is the Gateway to Upper Mustang. The monastery supposed to be some 500 yrs old which is situated in the town. Today is our final day for trekking, we slowly follow our trail back to Nayapul where we can take see beautiful local people and we cross the Paddy field, when we reach to Syauli bazaar the path is flat till Nayapul when we arrive in Nayapul then we drive Back to Pokhara .